MISSION ESL COMPUTER LAB: "The Real Sherlock Holmes", from Edcon Publishing. "The Real Sherlock Holmes", from Edcon Publishing. 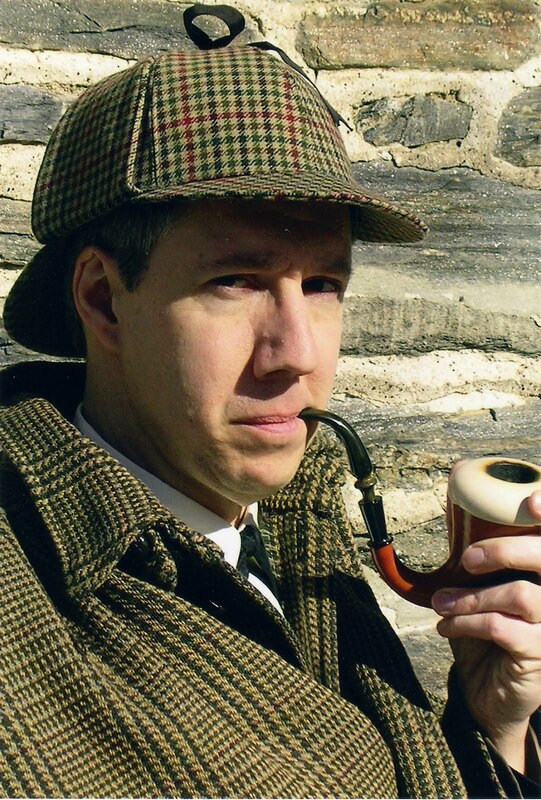 This famous detective was born in a doctor's office. The most famous detective of all time was Sherlock Holmes. Of course, he never really lived. He is a character in a series of mystery tales by Sir Arthur Conan Doyle. These stories have been admired all over the world for their clever detective work. Years ago, these tales were studied by police everywhere. 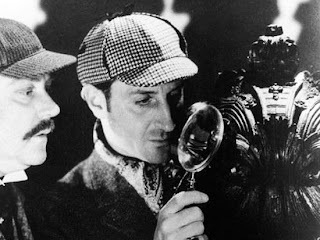 In some cities, Sherlock Holmes's work was even copied in the police laboratory. when Doyle was a young doctor in England. The doctor had very few patients. To give himself something to do and to earn some money, he started writing his stories about the tall detective and his fat friend, the faithful Dr. Watson. At first Doyle modeled Holmes after his college teacher, Dr. Joseph Bell. Bell used the discoveries of chemistry laboratories as well as his own fabulous ability to observe. He showed his students that they must use their eyes and ears carefully. He would look at a new patient and say, "This man is left-handed, and he makes shoes for a living." Then he would point out to his surprised students the worn place on the man's pants. The worn place showed where the man held the shoes that he worked on. Since the worn place was on the right side, the man must have held his hammer in his left hand. The students shook their heads in wonder and said that their teacher could observe details better than any police sergeant. The first Sherlock Holmes story was "A Study in Scarlet," written in 1886. Two magazines refused the story before another accepted it. The story was then held for several months before it was printed. But soon Sherlock Holmes had become a famous character. The public admired him so much that the magazine demanded more and more Holmes stories from Conan Doyle. The great success of these stories and the fabulous sums of money that they brought Doyle made him a man of great wealth. He gave up his practice as a doctor and devoted himself entirely to writing stories. Years passed, and Doyle grew tired of writing tales about Holmes and Dr. Watson and police sergeants. Because he wanted to write serious books, Doyle grew annoyed with the world's admiration for his detective. So he decided to kill Sherlock Holmes. He wrote a story in which Holmes and his enemy, Professor Moriarty, fought at the top of a high cliff. The two men, locked in each other's arms in a fierce struggle, fell to their deaths in the water far below. The public would not accept this death for their hero. After ten years, Conan Doyle had to bring Sherlock Holmes back to life. He explained in a new story that Holmes had escaped by climbing up the face of a steep cliff. 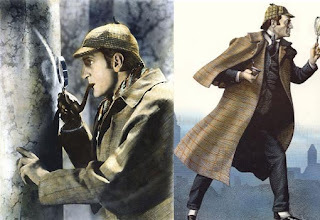 Although Conan Doyle never stated publicly that he really modeled Holmes after himself, we can now be sure that he did. Two different times in real life, Doyle used his detective abilities to put together the facts to free men from prison. He proved that the two men were innocent of the crimes they had been charged with. One was a black man named Edalji He had been sent to prison for the cruel killings of animals on nearby farms. Doyle was convinced that Edalji had been arrested and tried mostly because he behaved strangely and because he was black. Working as his famous detective did, Doyle proved that another man had committed the crimes. The second man that Doyle cleared was Oscar Slater. Slater had been sent to prison for robbing a wealthy old woman and killing her with a hammer. Doyle uncovered evidence that proved that Slater was not guilty. In describing Holmes, Doyle gave him some of his own ways and habits. He had Holmes wear a dressing gown like his own, and smoke a pipe like the one he used. He gave Holmes his own interest in chemistry and other sciences. Holmes and Doyle both treated women with unusually great respect. In their early days in London, both men struggled with poverty. They even lived on the same street. Doyle even gave Holmes his own kind of ancestors, including a French grandmother. In the story "His Last Bow," when Holmes was in disguise, he used the name Altamont, the middle name of Doyle's own father. There are books that explain how much Holmes was like the author. 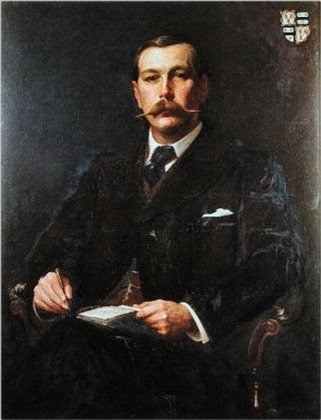 In "The Life of Sir Arthur Conan Doyle: The Man Who Was Sherlock Holmes", John Dickson Carr says that Doyle was very much surprised that the public could never see through the thin disguise. words of his widow. After her husband's death, she wrote an article called "Conan Doyle Was Sherlock Holmes." She told about his solving mysteries that the police could not solve. 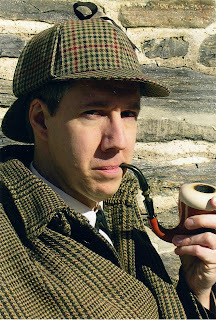 She wrote: "The public does not realize that my husband had the Sherlock Holmes brain." a. Sir Arthur Conan Doyle. a. a poem by Conan Doyle. c. the first Sherlock Holmes story. d. the last Sherlock Holmes story. a. made Conan Doyle famous. b. were laughed at by real policemen. c. were really written by Dr. Joseph Bell. d. were disliked at first by readers. a. made Sherlock Holmes a doctor. b. disguised Holmes as a woman. c. admitted that he was Holmes. d. had Sherlock Holmes fall to his death. a. often dressed up as Sherlock Holmes. b. solved two famous crimes. c. kept up his practice as a doctor. d. was never a poor man. a. is never based on a real person. b. is always a real person. c. can become more famous than a real person. d. can never be forgotten. c. "The Writer Who Wrote about Himself." d. "The Death of Sir Arthur." b. a struggle with poverty. c. the ability to observe details. Sherlock Holmes, "A Scandal in Bohemia"
Sherlock Holmes, "The Bruce Partington Plans"
Sherlock Holmes, "The Solitary Cyclist"